As a little girl, I used to collect charms and trinkets that held what I believed to be magical powers. Some were just "for pretends" and some were tried-and-true good luck tokens that brought me strength during times of shyness and insecurity. I never quite grew out of my interest in charmed objects, perhaps mostly for the feelings such symbols conjure. A few weeks ago, this unique pendant came in the mail for me. It has become one of my favorite charmed objects. It was made by my darling friend, Erin Scully, who is a metalsmith and jewelry designer. 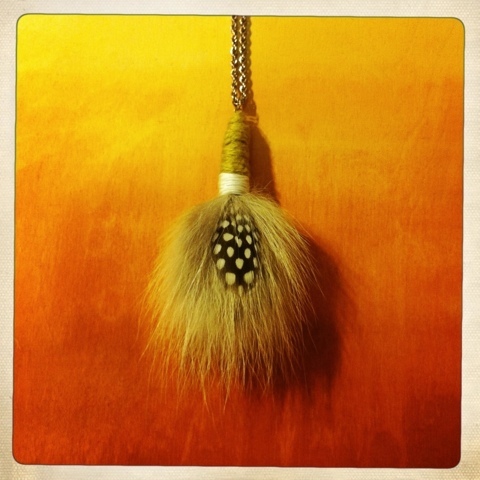 Among other designs, she deconstructs vintage furs and up-cycles them into unique, one-of-a-kind pieces of jewelry. Vistit Aeryn Kae, her Etsy shop, to view more of Erin's lovely work. "It is a terrible fight and it is between two wolves. One is evil- he is anger, envy, sorrow, regret, greed, arrogance, self-pity, guilt, resentment, inferiority, lies, false pride, superiority and ego." He continued, "The other is good - he is joy, peace, love, hope serenity, humility, kindness, benevolence, empathy, generosity, truth, compassion and faith. The same fight is going on inside you - and inside every other person too." So Erin's wolf pendant has become a talisman of sorts, giving me strength in knowing that I have the power to choose where I focus my energy. I've been grateful for the reminder these days, as I battle feelings of guilt and self-doubt, and strive to let faith and joy overcome.